2019 Día resources are here! Click on the Free Program Downloads tab to download the new 2019 Día web badges, booklists, and banners! Also download the Día event poster, add details about your event, and promote your Día celebration. Read more about 2019 Día resources are here! Congratulations to the winners of the Center for the Study of Multicultural Children's Literature 2019 Día Grant with an African American Focus. The three winning libraries each will be awarded $500 in selected multicultural children’s books. Congratulations to the winners of the Center for the Study of Multicultural Children's Literature (CSMCL) 2018 Día Grant with an African American Focus. Latinxs in Kid Lit is an Official Día Supporter! Latinxs in Kid Lit is an online resource for readers of all ages interested in sharing our enthusiasm for children's books by/for/about Latinx. The site offers a broad forum on Latinx children's, Middle Grade, and Young Adult books. Read more about Latinxs in Kid Lit is an Official Día Supporter! April 30 is Día! Have you registered your Día event in the National Día Program Registry? There is still time! Enter your details now and use your customized event page link to promote your celebration. Visit our Free Program Downloads page to create a poster to spread the news, and free booklists for great reading suggestions. 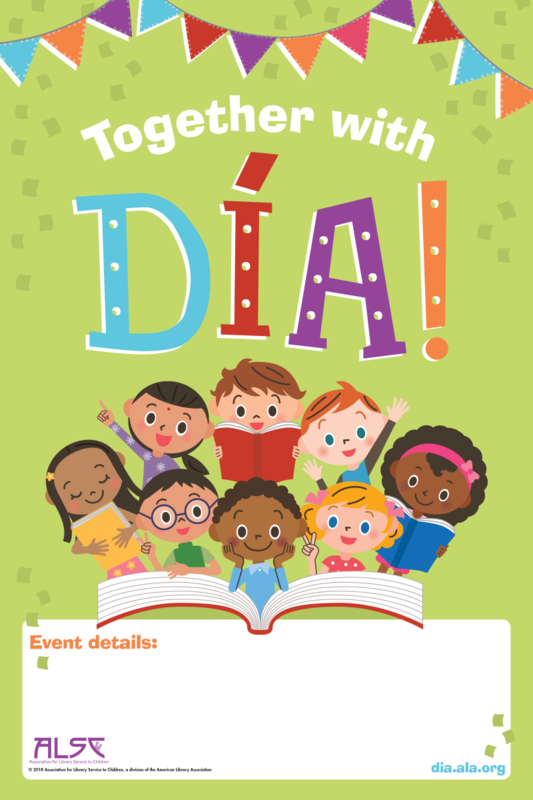 ALSC will share news and information about Día 2018 using the hashtags #diatogether, #STEAMwithDia and #sharebookjoy. Join us! Read more about #sharebookjoy for Día 2018! The Molina Foundation is an Official Día Supporter! ALSC welcome's the The Molina Foundation to the Día family as an Official Día Supporter! The Molina Foundation is a national nonprofit organization focused on reducing disparities in access to education and health. Visit http://molinafoundation.org/ for more information about their Share a Story Campaign for Kids and other resources for your community! Since its inception in 2004, The Molina Foundation has worked with more than 2,500 organizations and schools towards this end, donating over 4 million books and hosting workshops and programs for educators and families. The Molina Foundation works hand-in-hand with community-based organizations in vulnerable communities. We partner with preschool programs, clinics, schools, family service organizations, churches, and other civic organizations serving low-income and at-risk families. Read more about The Molina Foundation is an Official Día Supporter! April is here, so that means Día’s big day is only a few weeks away! How will you celebrate Día this year? 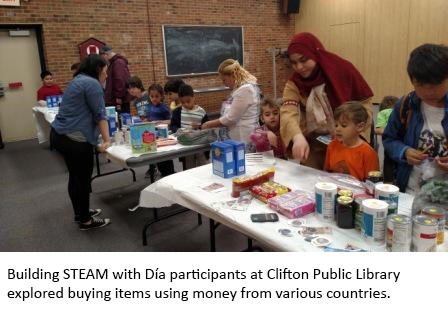 On and around April 30, libraries, schools and communities will host families to celebrate El día de los niños/El día de los libros (Children’s Day/Book Day). If you need resources and ideas for your event, ALSC has you covered! Visit the Free Program Downloads page to download booklists, event posters and sample activities. Also, add your event to the National Día Program Registry to attract more participants! Visit author Pat Mora's website for many more ideas including the newly updated Children’s Day, Book Day Planning Booklet. There, you will find a planning checklist and information about potential funding sources. Share news about how you're celebrating Día by using the hashtag #diatogether. Read more about April means Día! New Día graphics Available for Download! Nothing says We're Celebrating Día like a new poster! Customize this poster with your event information to promote your upcoming Día programs. Get this poster along with new web badges and Building STEAM with Día booklists by clicking on the Free Program Downloads tab. Use the web badges to proudly display your excitement and support for Día on your social media pages, websites and promotional materials. Let's make 2017 the year people understand the importance of sharing excellent books filled with diverse characters and stories with our children. Read more about New Día graphics Available for Download! February is Black History Month. It's the perfect time to discover a new book by a black author or illustrator. There are so many good choices out there, but if you need suggestions, here are a few great places to start.